Family mealtimes are important times. In fact, families who eat together regularly share healthier and better balanced meals, have children who engage in less risky behaviors and have parents who are more actively involved in the lives of their children. But for today’s busy moms, preparing a meal (and getting everyone to the table at the same time) can take more time and energy than they have available. As a matter of fact, some days, it can be downright impossible. Enter my series of Quick Family Meals. If you’re looking for easy-to-make one-dish meals, I’ve put together the Quick Family Meals series just for you! Directions: Cut up vegetables into large chunks and place in crock pot. Place roast on top of vegetables. 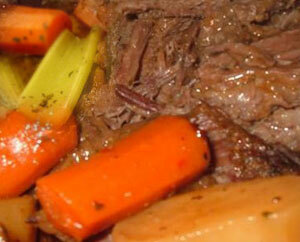 Put 3 bouillon cubes on top of roast and pour in water. Cover, and cook on low for 6 to 8 hours or High for 4 to 5 hours. Caron Goode’s (EdD) insights are drawn from her fifteen years in private psychotherapy practice and thirty years of experience in the fields of education, personal empowerment, and health and wellness. (www.acpi.biz). Look for Caron at HeartWiseParenting.com too. Reach her at carongoode@mac.com.